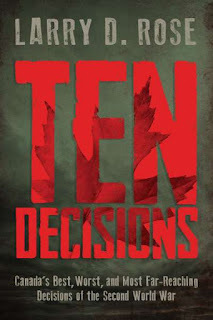 TEN DECISIONS: Canada’s Best, Worst and Most Far Reaching Decisions of the Second World War was written by Larry D. Rose. Rose has worked as producer of CTV National News with Lloyd Robertson and as news director at CTV Kitchener. He has also worked for The Canadian Press and Global News and served as a second lieutenant and later as a captain in the Royal Canadian Armoured Corps (Reserves). He is the author of MOBILIZE! Why Canada Was Unprepared for the Second World War. The topics covered include the British Commonwealth Air Training Plan, industrial policy that resulted in the revolutionary development and production of synthetic rubber and the decision to launch the Dieppe ‘raid’. The book also focuses on some of the most powerful leaders of the war including General Guy Simonds, “Minister of Everything”, C.D. 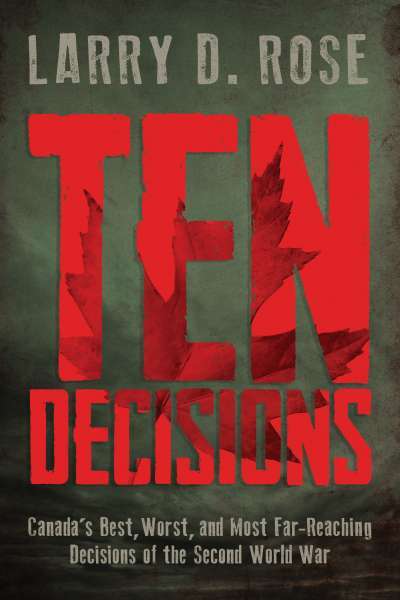 Howe and Prime Minister Mackenzie King role as an unlikely but surprisingly affective wartime leader. One of the most interesting decisions covered here is the Ogdensburg Agreement. Never signed, existing only as a press release and often forgotten today it turned Canada from its British past to its North American future and had enormous consequences. Equally consequential were the decisions made during and just after the war designed to prevent the return of the Great Depression and to adequately care for veterans. The effect of these various measures was to bring about a post war boom and change Canadian society forever. While it is currently fashionable to judge people and events based on contemporary standards and customs it does little to help us understand these episodes. One of the most enjoyable aspects of this book, as with his previous work, is the author’s ability to help the reader to appreciate the times, politics and motives which drove these decisions and the people who made them.